Darlings, to your left you will find Christian Louboutin’s blissful Bibi 140 Suede Platform Pumps – the very same piece of frippery seen donned by Lauren Conrad, Isla Fisher, Blake Lively, Khloe Kardashian, Katy Perry, and Brooklyn Decker; now, if you’ll take a peek to the right, you will find BCBGeneration’s jaw-dropping Jodie High Heel in Black. Though Jodie’s heel clocks in at 5”, as opposed to the teetering 5 ½” of the luscious Louboutin’s; for a mere $89.00, in comparison to the $795.00 needed to take Bibi home, they are every bit as capable of allowing the savvy stylista to snag a little starlet style – on a budget! Are you having a tightwad moment darlings, or are you plagued with a craving to splurge? Thanks to Net-A-Porter and Zappos for the pictures. Don't forget to enter the Pop Goes the Bauble Giveaway for your chance to win a Blue Frame Pendant Necklace from Helzberg Diamonds. Don't forget to enter the Ruffle My Feathers Giveaway for your chance to win the DownEast Basics’ Real Ruffle Tee from J.E.M. Apparel. Don't forget to enter the Your Face Here Giveaway for your chance to win an 8 x 10 Canvas Print from Easy Canvas Prints. such a great find! 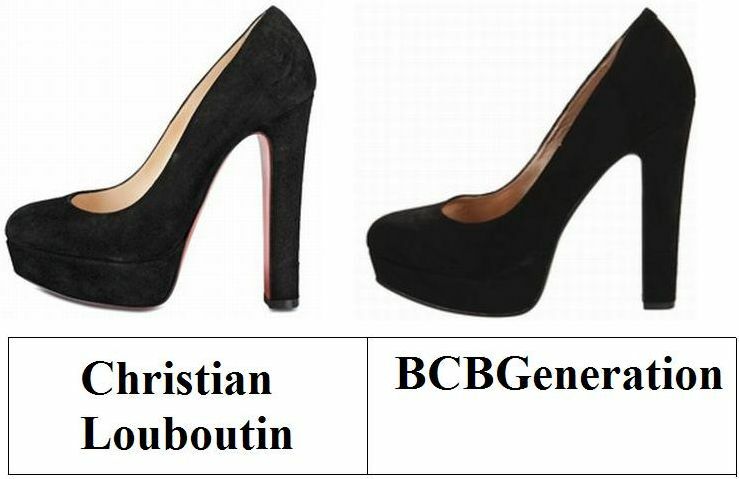 I actually like the BCBGeneration! I'd have to budget..on these. Great find. Awesome shoe. I'm on the cheap. Oh my! So glad you've found a cheaper version. Love the tightwad post! It's unbelievable how similar they are, at least in the pictures. I am cash strapped right now, and style for less is my perpetual motto. Thanks for sharing. Great find as always Erika! If the bcbg ones are at all comfortable I would vote for them--I just sold my brand new platform pump Louboutins on ebay because they hurt my feet so much I could never wear them out! Hoping you will please find some good flat/mid-heels to feature soon! i am always having a tight wad moment it seems, but sometimes i think a splurge is necessary. I hope BCBG makes a size 11! The BCBGeneration looks nearly exactly the same. But either ways, I can't wear high heels because I can't walk in them. lol! Gorgeous! I actually have a similar pair that I got for less than $40 at GoJane! The BCBG pair is an exact replicate! Plus, they make great shoes, so I would go with the cheaper pair for sure! Man, you always know what stars wear what. You definitely have your finger on the celebrity pulse. these shoes look so similar that no doubt i'd take the BCBG ones... ha! Do you watch Guilana and Bill on Style? Did you see the one where she tries on Christian Loubiatons and is like, "This is so much better than a book?" DEFINITELY BCBG pair, would love to own the louboutins but obvs my wallet cannot afford that! I do love BCBGeneration. But how can I ever pick against Christian Louboutin? I love, LOVE the Loubs, but I don't know if even I could handle 5.5 inches! I do love the red soles, they are forever! Wow! I'm on the hunt now. Love them BOTH! Maybe choose the BCBG ones for the darker appearance? i could never say no to louboutins! LOVE them!!! i still wish i could wear heels. but these are to die for!! i would go with the cheaper ones because they look the same quality! Black heels are a must for any girl! I love the BCBG ones. Christian Louboutin the one and the only! BCB ones are cute. though! Thats a great price for the BCBG shoe! They look just the same...maybe even better! :) I hope you had a great holiday! I don't know but the darker black of the BCBGeneration heels make me want them really bad. Louboutin can wait! Just wondering what you get for spending the xtra $700! And is it worth the extra expense? Love the look of both shoes! Louboutins are of course priceless, but the BCBG's do look like a great alternative! Almost identical so I say definitely go for the cheaper pair. Beautiful shoes!! I wanna have some..It'll be the cheaper version. I am a huge fan of Louboutins but I wouldn't say no to the BCBGs!! !